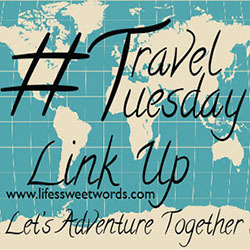 Life's Sweet Journey: Monday Funday! Fun with Flo!! Happy Monday Friends! I hope your weekend was full of all things wonderful! Don't ask why I am standing like a flamingo, my answer would be just as unsure as yours! We just go with it! Today is a day of firsts for this little space and I am nervous as all get out! I have never posted videos before (at least not ones of me), but I figured video documenting would be the best (and in my opinion funnest - maybe make that funniest) way to share our new travel trailer journey with you! My dream to get a travel trailer evolved into the little beauty that you will see in these videos. Her name is Flo (short for FloRida Reva) and I am so excited for you to meet her. She is quite excited too! Who may not be as excited is sweet Babe. He has learned to embrace this space I call a blog, but he doesn't like to appear on it, or be mentioned, much. You see his love and my love for social media are about as different as our dispositions (which is to say they are very much opposites). And he had refused any videos be taken of himself. However, he also had denied the idea of any sort of travel trailer at first, and well, we see where that got us. But he loves Flo already and is just almost as in love with her as I am. And I am also in love with sneaking him into my videos. I hope you enjoy these little snippets of our time testing out the waters! *Side note- the place we purchased her asks you to stay over at least one night so that they can help walk you through how to use everything and fix anything that may be an issue. It was so great, we stayed two nights! I was smitten from the first moment I met her. 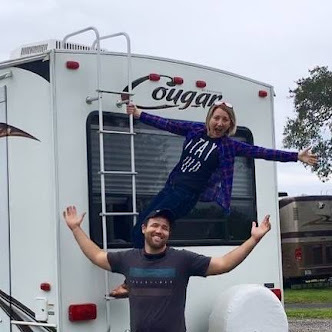 We had been looking and searching, hitting up multiple RV dealerships and never feeling "right". If I feel pressured in anyway I will most likely walk away. Lazy Days made us feel right at home and then our sweet dealer stayed until way past closing time, helping us find just the right fit for us. Flo was the final model we looked at (after already having mostly picked another one out) and she was hidden "behind the scenes" in the incoming sell-back bay (her previous owners had already traded her in for a bigger model, after only 6 months). She was just waiting there, especially for us! Yay for the right timing and fit! Our first weekend with her couldn't have been any sweeter! So learning the ins and outs of travel trailer life mostly boiled down to one thing for us, the toilet. Mostly everything else ran pretty self-explanatory, but the toilet, or to be more precise the emptying of it, got somewhat of the best of us. *Note- Don't do what we did and think you don't need gloves. We figured we would get some eventually, when we could didn't have to pay the uncharge for buying them from the RV store. "It won't be a big deal the first go round, right?" Just get them! It's not the prettiest of business. I would recommend getting some before you ever even get to the dealership. That was one thing we unfortunately left off the Target stock-up list. Not videoed: The obsessive hand washing that followed. **On another note- While I was quite impressed with my idea of flushing out the toilet with clear water in hopes that the tank meter would read correctly, Babe just decided to remind me of the actual flush valve located on the outside of the RV for just that purpose. Of course he decides to tell me that now that the video is done and I am all proud of my ideas (or really my use of Pinterest). Oh bless this sweet video! I am somewhat partial to it, mainly because sometimes you just need a good laugh at yourself! This was suppose to entail all the things that went wrong with learning to use FloRida for the first time, however, I think it simply became a montage of things I just couldn't seem to get right. And God love my sweet husband, for a man who doesn't really want any video limelight he sure looks pretty sweet to me; not that I am biased or anything. *Turn the camera sideways!! Sorry folks!! *Be super thankful for sweet workers who are super patient with your excitement and put up with you having your camera out the whole time they are walking you through everything. *Be super thankful for your husband who puts up with this same problem many days of his life; it's something were working on! I promise! It goes away a lot more than it used to. *Learn more about quality and use your nice camera! Again sorry!! I can not wait for all the exciting adventures to come!! First stop, Fort DeSoto and St. Pete! Friday here we come!! I loved getting to share these moments with you and I hope you enjoyed them! I hope you can forgive the poor quality! It's all a learning process. I am far more comfortable with still life than movie videos, but it sure was fun! And in honor of all the fun and Flo's first videos, I thought it would be fun to link-up together to beat some of the Monday blues. So join me by adding any post that you deem fun enough for "Monday Funday"! Peek around to enjoy the fun with everyone, but otherwise there are no rules, I'm not really huge on those around these parts! 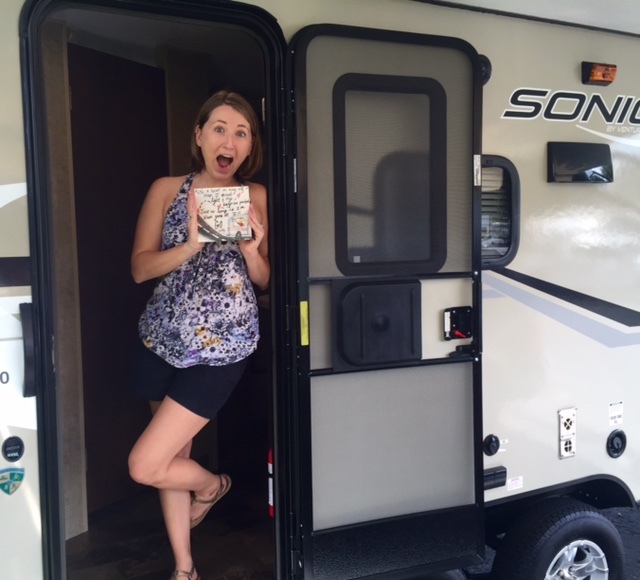 Definitely excited about the adventures too :) Thanks for stopping by! I love a girl with a zest for life-documenting like me!! Happy Tuesday!! haha this is funny!!! Great job on your first videos :) . and congrats on your new toy! The frog was so cute!! Thank you so much! Your encouragement is so sweet! And haha, we loved sweet little Fred! Thanks for stopping by!